The day was hot and the small band of about 400 Pawnee men, women and children was returning from the summer buffalo hunt, their horses and travois laden with meat when they were suddenly attacked by their traditional enemies the Sioux. A thousand Sioux warriors followed the Pawnee into a canyon where the Pawnee sought protection. However, Pawnee hunting bows were no match for Sioux rifles and the battle was turning into a bloodbath. In the heat of the fight, a Pawnee father lashed his five-year-old daughter to his horse and bound his “sacred bundle” to her back. “Take care of this bundle and it will take care of you,” he said as he slapped the horse sending the little girl directly into the enemy line. Miraculously she made it through and was one of the few Pawnee to survive that fateful day in a battle that came to be known as Massacre Canyon. The mighty Pawnee, who once roamed vast swaths of Nebraska and Kansas for over 600 years, were relegated to “Indian Territory” in Oklahoma nearly 150 years ago. The tribe was decimated by starvation and disease, and lost much of its culture and traditions. Today, however, tribal chiefs, members and others are working to reclaim rituals, revive the language, and reestablish the most important component of all, Pawnee sacred corn. Long before the Pawnee and other tribes we now associate with the Great Plains arrived, archaeologists have found traces of various prehistoric peoples who inhabited the area as early as 8000 BCE. These were nomadic people who followed the buffalo and later took up farming. Somewhere around 1200 CE, the Pawnee, who had migrated north from Central America to western Texas, decided it was time to move farther north likely due to drought. Scouts, finding the soil near Nebraska’s rivers to be rich and healthy, reported back, and the tribe decided to make the central plains its new home. They were soon followed by the Sioux (Lakota), who migrated from Minnesota, and the Cheyenne, who came from southern Canada. The Pawnee eventually settled in Nebraska and Kansas, choosing land near rivers and streams and building lodges on the higher banks. Archaeologists have found Pawnee village sites along the Platte, Loup, Beaver, Blue, Republic, and Smoky Hill. Pawnee earth lodges were often oval in shape. The door of each lodge was placed facing the east and the rising sun. Surrounding the lodges were fields of beans, squash, pumpkins, and watermelon, but mostly there were fields of corn. Daily life combined village activities, farming, and seasonal hunting of the buffalo. At one time, before the advent of the European colonial powers (Spanish, French, English), the estimated Pawnee population ranged between 10,000 and 20,000 or more. They were one of the largest and most powerful tribes in the Midwest. The traditional enemies of the Pawnee, in addition to the Sioux, included the Cheyenne and the Arapaho. They also waged war occasionally with the Comanche and the Kiowa farther south. In the Pawnee language, the Pawnee people refer to themselves as Chaticks si Chaticks or Men of Men. Buffalo and corn were staples for the Pawnee. And like the buffalo, corn was sacred. An ear of corn and a buffalo skull adorned the sacred altar in each earth lodge. Corn was an important part of every Pawnee ceremony and every feast, and was eaten at almost every meal during the year. Corn was easily stored and preserved during the cold winter months and was often dried to use later. Dried corn was made into hominy. Women also ground corn into a powdery form called meal. Corn meal could then be used for cornbread, corn syrup, or corn pudding. Often corn meal was mixed with beans to make succotash or to thicken other foods. Like many other Native American tribes, the Pawnee had a cosmology representing all the elements of nature. They believed they were descendants of the stars and planted their crops according to the positions of the stars. Pawnee women were skilled horticulturists and cooks, cultivating and processing seven varieties of pumpkins and squashes and eight types of beans. In addition, they planted 10 different strains of corn including Red Corn, White Corn, Blue Corn, and Eagle Corn. The varying varieties of corn had to be kept apart so as not to cause cross-pollination. The women planted seeds in small round hills, each hill being an adult footstep apart from the next. Seeds weren’t planted in uniform rows and were planted in no particular direction. Hundreds of acres were planted to feed the tribe. While important to agriculture, squash and beans were not given the same theological meaning as corn. In addition to eating the corn kernels, nothing from the plant went to waste. Husks from the cob were braided into masks, sleeping mats, baskets, and even cornhusk dolls. Shoes were sometimes made of cornhusks. All that would be left was the corncob. Even these were used to make darts, burned as fuel, or fashioned into ceremonial rattle sticks. Corncobs were tied to the end of a stick to dangle and rattle against other corncobs. Corn, however, was never traded because it was so sacred. After planting and working the corn a second time with their buffalo-shoulder hoes, Pawnee women would leave with the men on the summer buffalo hunt. The corn and other vegetables were on their own until the tribe returned in September for the harvest. Massive amounts of corn were stored in underground caches. These caches sustained the tribe through the following year. Sacred bundles consisted of a collection of precious objects from a Pawnee family passed down by the women in each generation. They were used in many religious ceremonies to maintain the balance of nature and the Pawnee relationship with the gods and spirits. Scholars have described the presence of sacred bundles among numerous Native American cultures, but the most extensive use appeared to be among the Pawnee. A Pawnee leader owed his status to the possession of a sacred bundle, which was a buffalo skin containing items thought to have supernatural powers, such as a pipe, pigments, tobacco, and corn. Other contents might include a long pipe, arrows, hawk bells, counting sticks, and glass beads. These tools were necessary for Pawnee sacred ceremonies, and the rituals associated with the items were passed from generation to generation along with the bundles. As mentioned, the bundles were owned by women and inherited through the female line but could only be used by men. The perfect ear of Holy Corn was an important component of a sacred bundle. Holy Corn was cultivated and harvested to replace corn in the sacred bundles that had been removed during spring planting and autumn harvest ceremonies. Corn was regarded as a symbolic mother through whom the sun god bestowed blessings. Each year the bundles were revitalized by the addition of the perfect ear of corn after harvest. The cycle of corn determined the annual agricultural cycle since it was the first to be planted and first to be harvested. A sacred bundle’s power came from the star under whose direction the bundle was assembled, and it carried power from the objects secreted within. It is believed this practice originated with the assistance of sacred beings that appeared to certain individuals in visions or dreams. Bundles played a vital role in Pawnee religious life. Besides the planting and harvesting ceremonies, sacred bundles were used to obtain success in hunting, warfare, and curing illness. The Pawnee’s initial contact with the US government came in 1818 with the first treaty. This treaty, plus those that followed, were rarely beneficial to the Pawnee and brought an erosion of Pawnee culture. Westward movement of land-seeking settlers brought greater demands for Native lands. Pawnee treaties with the federal government in 1833, 1848, and 1857 called for cession of most of their lands and their removal to a reservation in what is today Nance County, Nebraska. By 1860, the Pawnee had lost thousands to infectious diseases, such as measles, small pox, and cholera, to which Native Americans had no immunity. Their population was reduced to about 4,000. It was further reduced by crop failure and warfare to about 2,400 by 1873. In 1874–75, the tribe was again forced to move from its ancestral Nebraska homeland, with its family graves and spiritual places, to a reservation in Indian Territory in Oklahoma. Tribal members took what corn they could carry in each family’s sacred bundle. The Pawnee were not allowed to hunt buffalo before leaving Nebraska, which would have provided food for the long walking journey. Consequently, many died on the way to Oklahoma. When the tribe finally arrived, there were fewer than 1,000 people. Once in Oklahoma, the Pawnee experienced even greater loss of life to illness, hunger, and death. By the start of the 20th century, the Pawnee population had decreased to fewer than 700 tribal members. The 1900 US Census recorded the Pawnee population as 633. It is not known how many Pawnee sacred bundles came to Indian Territory in the 1870s after the tribe was removed from Nebraska. However, the owners of those bundles were the last generation of Pawnee who received empowerment in their native country’s sacred places. After death, many of these bundles were buried with their owners. Others were burned when their owners died from contagious diseases. Some ended up on museum shelves. In addition, the spread of Christianity decreased the importance of sacred bundles. Today, the complete ceremony associated with sacred bundles is no longer known to the Pawnee, but respect and awe for those that remain in the tribe continues. Once they arrived in Oklahoma, the tribe immediately attempted to plant their corn seeds, but Oklahoma soil is not like Nebraska’s rich soil, and the corn failed year after year. Four generations later, the seeds were few and on the verge of extinction. Tribal elders decided that the precious few seeds left should be stored away and no longer planted or used in ceremonies. By the mid-1990s, the Pawnee community realized the importance of reviving tribal culture and educating Pawnee youth about their ancestors and the tribe’s history. They organized the Pawnee Culture Committee. The committee wanted to determine how many Pawnee corn seeds still existed. In the spring of 1998, a call from the Culture Committee for traditional seeds went out to all tribal members. At this time, the Pawnee identified three varieties: Blue, Yellow, and Eagle Corn. Those who wanted to start a garden were encouraged to bring their seeds to tribal elder Lula Nora Tilden Pratt, who would offer a traditional blessing. Nora was born in 1909 in Pawnee, Oklahoma, and she was called upon for her cultural insight. Nora’s prayer, the Blessing Over the Seeds, marked the beginning of the Pawnee Seed Preservation Project. Elder members began cultivating the few seeds that remained with the help of some of the tribe’s youth. Eventually, nine traditional varieties of Pawnee corn were found, but not all would germinate, and some varieties consisted of only a handful of seeds. By 2003, Deb Echo-Hawk, a tribal member originally from Colorado who had been working with her own seeds since the 1980s, had been designated Keeper of the Seeds. She was contacted by Ronnie O’Brien, director of cultural education at the Great Platte River Road Archway in Kearney. O’Brien had an idea for a new program highlighting the Pawnee way of life in Nebraska. After much discussion, the two women arranged for some seeds to be returned to their original home. 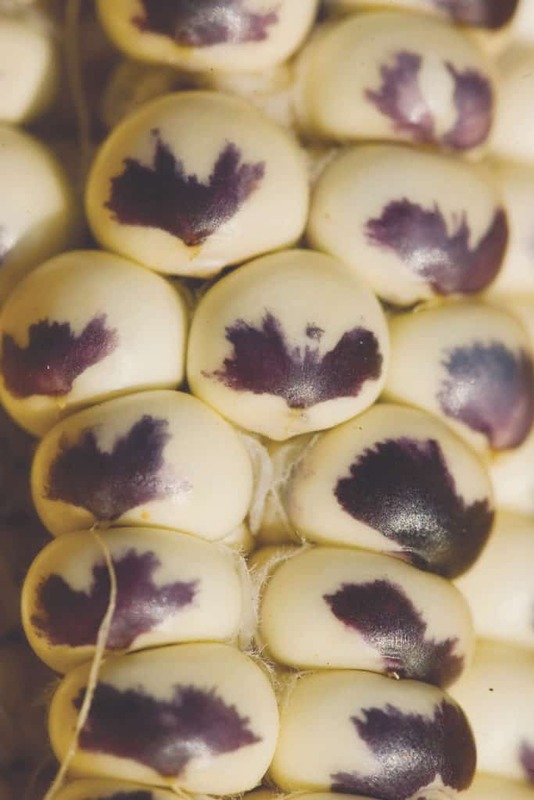 One of the first varieties to be entrusted to a few select Archway growers was Eagle Corn, named for dark spots on its white kernels that look like an eagle in flight. This variety is believed to date back to the 1200s when the Pawnee traveled north to Nebraska. Only 50 kernels of Eagle Corn remained, stored in a mason jar in Pawnee, Oklahoma. Echo-Hawk decided she would only send 25 kernels to Nebraska, keeping the remaining 25 kernels in case the seeds sent to Nebraska did not germinate. Initially, the seeds failed, but the following year, 2005, the final 25 Eagle Corn seeds took hold and thrived with the help of a horticulturalist. In the end, about 2,500 seeds were produced for the tribe. Since then, the Pawnee Seed Preservation Project has grown to include 17 gardeners and one farmer growing several varieties of Pawnee corn on plots from Omaha, to Mason City and Genoa, to Bloomington. In November 2010, the Nebraska planters were invited to Pawnee, Oklahoma, for a celebratory ceremony called the Young Dog Dance. During the ceremony, Eagle Corn soup, described as being similar to almonds with cream, made from Eagle Corn grown at the Archway’s garden, was served for the first time in 125 years. Pawnee Spotted-Like-a-Horse beans were also served for the first time in living memory. The Archway has since advanced the Pawnee Seed Preservation Project of Nebraska to include more than 10 varieties of corn plus beans, squash, pumpkins, sunflowers, and watermelon. In addition, the Pawnee in Oklahoma have successfully grown three varieties of their corn in the town of Pawnee, where they live today. Echo-Hawk added that the Pawnee chiefs plan to select more seed keepers, who will learn to grow corn and also learn the songs, history, and heritage behind the sacred seeds. Corn was a well-developed crop in Nebraska long before any Europeans came here to settle. In fact, Native Americans alone domesticated nine of the most important food crops in the world, including corn, more properly called maize, which in 2010 provided about 21 percent of human nutrition across the globe. An additional striking fact about corn is that it does not grow in the wild anywhere on the planet. Scientists now believe corn may be related to a Mexican grass called teosinte. Teosinte ears are skinny and have just a dozen kernels wrapped inside a stone-hard casing. However, George W. Beadle, while a graduate student at Cornell University in the early 1930s, found that corn and teosinte had very similar chromosomes. Beadle concluded that the two plants were members of the same species with corn being the domesticated form of teosinte. Further research by Beadle and others discovered that all corn was genetically most similar to a teosinte type from the tropical Central Balsas River Valley of southern Mexico, suggesting this region was the cradle of corn evolution. In addition, by calculating the genetic distance between modern corn and Balsas teosinte, researchers estimated that domestication occurred about 9,000 years ago. * The little girl’s name was Sadie and her bundle has been on display at the Pawnee Indian Museum State Historic Site near Republic, Kansas, since her granddaughter Elizabeth presented it to the Kansas Historical Society in 1987. Blaine, Martha Royce. Some Things Are Not Forgotten. University of Nebraska Press, 1997. Burk, Shay. “Project Grows Pawnee Heritage.” Hastings Tribune, August 20, 2017. Burk, Shay. “Pawnee Corn Coming Back Strong.” Hastings Tribune, March 26, 2018. Carroll, Sean B. “Tracking the Ancestry of Corn Back 9,000 Years.” New York Times, May 24, 2010. Kansas Historical Society, “Sacred Bundle,” June 2014. Lynch, Tom, Paul A. Johnsgard, Jack Phillips, editors. Natural Treasures of the Great Plains: An Ecological Perspective. Prairie Chronicles Press in partnership with the Great Plains Ecotourism Coalition, 2015. Maxwell, James A., editor. America’s Fascinating Indian Heritage. The Reader’s Digest Association, Inc., 1978. Potter, Lori. “Pawnee Corn: Sacred and Sustainable.” Kearney Hub, Sept. 2, 2017.